Lavaca currently has an event decal parking program that includes hang tags and street closures during special events. This program has its problems: streets get closed, there is confusion over when a special event is occurring, guests to the neighborhood get confused, and enforcement is sparse. We are looking to improve this program with one that is enforced 24/7. A residential permit parking program allows for certain areas of on-street parking to be designated for resident parking only at all times. Currently, commuters regularly use our neighborhood streets for daily parking, leaving little room for residents to park. In addition, during events, parking is congested. This pilot program would allow for Resident Only parking on one side of the street and open parking on the opposite side (for the general public or resident permit holders). 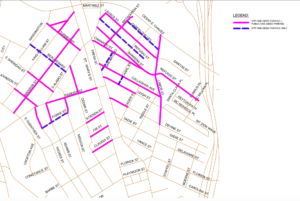 How does my street get a RPP designation? The neighborhood associations have volunteered to be the applicant for the RPP. Neighborhood leaders will be the liaison between the City of San Antonio and the neighborhood. Neighborhood leaders will canvas the pilot program streets. A petition will be circulated to document support or opposition to the pilot program. In addition, residents will be asked to identify the odd or even side of the block for the RPP restricted parking. The petition should be signed by the occupant of the property. Property owners are not required to sign the petition. For duplexes or apartment buildings, a signature is needed from a resident of each unit. If there are 60% of residents on a block opposing the pilot program, that block will not be included in the pilot program. The event decal program in the Lavaca neighborhood will only be enforced for the first six months of the pilot program. Once the petitions are received and reviewed by City staff, staff will make a recommendation to City Council for program adoption and identify the streets participating in the pilot program. Once adopted, the City will notify residents when it becomes effective and how to purchase permits. You may purchase up to 4 permits per parcel. Multi-unit dwellings may purchase up to two per unit. Am I guaranteed an on-street space with my permit? No, the program does not guarantee or assign specific on-street parking space for permit holders. Permit holders may park on either side of the street. If you do not have an extra hang tag to loan to your visitors they must park on the open parking side of the street. Will the barricades still be used? Barricades will remain for 6 months and then be taken down for 6 months during this 1 year pilot program.